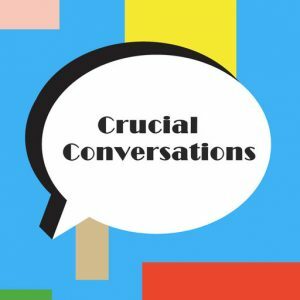 This week Deidre & JG talk about crucial conversations and why we avoid them. Have you ever needed to have a conversation with someone you work with or love, that you tried to avoid at all costs? A conversation that could have a huge impact on your relationship, that may be challenging, frustrating, annoying, or even scary – that’s a crucial conversation. Stakes are high and emotions are kicking in, what do you usually do? Typically, we either avoid it, face it poorly, or face it well. Those that know how to face it well have mastered the art of dialogue. Listen to the episode for more wiZdoms! Have a dialogue instead of an argument. Your emotions have to take a back seat in a crucial conversation. Practice how to express yourself without expressing emotions. When your emotions are high, logic is low. The best way to communicate is to be a good listener. 50% of great communication is being a good listener. Listen without judgement, don’t listen just to reply, and be mindful of your delivery. Practice active listening. Make it a “carefrontation” instead of a confrontation. Thinking that confrontation is bad will only fuel your fear. Confrontation is a healthy part of dialogue. Make the other person feel like there is mutual respect and that you care about resolving the problem. Look closely at what you’re trying to avoid. Why are you trying to avoid it? What am I afraid is going to happen? What might you gain from speaking up? Shake the fear and have the conversation anyway. Stick to “I” statements. Put the focus on “I” instead of “you”. The person you’re having the crucial conversation with won’t feel attacked and will be more open to what you’re trying to say to them. LISTENERS: DO YOU AVOID HAVING CRUCIAL CONVERSATIONS? Send us your answer. Either leave us a voicemail at 1-646-653-9278 or send us an email. We may talk about it - or we may even talk with YOU - on the air!